Finally, after months of waiting, Google is enabling wireless Android Auto for owners of Google Nexus and Pixel devices. If you own the Google Pixel, Pixel XL, Pixel 2, Pixel 2 XL, Nexus 5X, or Nexus 6P, then you can now connect your phone to a compatible Android Auto Wireless car kit. We’ve seen glimpses of the Android Auto app supporting wireless connectivity for quite some time, but the feature is only now available with version 3.1 and above of the app. JVCKenwood unveiled a few Android Auto Wireless head units at CES 2018, and even Google was at the event promoting the upcoming launch of the feature. After 4 months, various owners of the Google Nexus and Pixel devices on Reddit and Google’s Product Forums have started to notice the feature quietly go live for them. 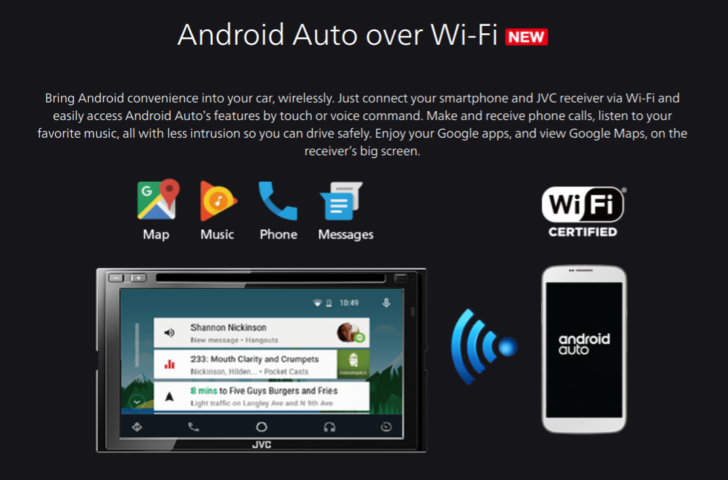 A car or aftermarket receiver that is compatible with Android Auto Wireless. The Android Auto app version 3.1 and up. A high-quality USB cable for initial setup. The Googler also said that the company is “actively working with phone manufacturers on adding software compatibility” so non-Google devices can enjoy the new wireless functionality. We hope to learn more as we’re sure that many users are eager to ditch their cables in their vehicles. Personally, I dread the idea of plugging my phone in while I’m in a vehicle because of how hot it can get. Now that there’s an alternative, hopefully I won’t have to sacrifice too much battery life!